Caring for six goslings, an adult Canada Goose keeps a close watch out for any strange occurrences while swimming with the family along the shores of Lake Erie in Point Pelee National Park in Leamington, Ontario. 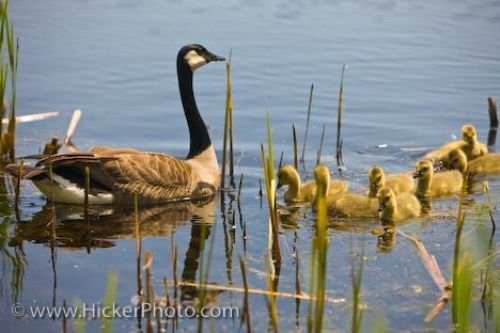 A Canada Goose is very protective of the goslings until they are old enough to soar for themselves after the spring migration. With a yellow/grayish coat of down, the goslings mature very rapidly and grow their feathers at around 9 to 10 weeks, allowing them to take flight. When fully grown, the Canada Goose will be between 30-43 inches long and the male weighing 7-14 pounds. The female goose will be a fair bit smaller in size weighing in between 5.5 and 12 pounds. Picture of an adult Canada Goose staying close to 6 goslings along the Marsh Boardwalk in Point Pelee National Park, Ontario.